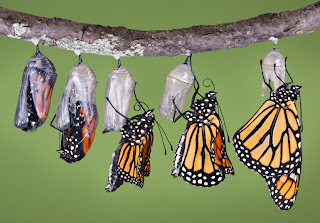 Yesterday I jabbered on about how we are destined for more than the life of happy little caterpillars.... we are here to emerge as ineffable and majestic butterflies. 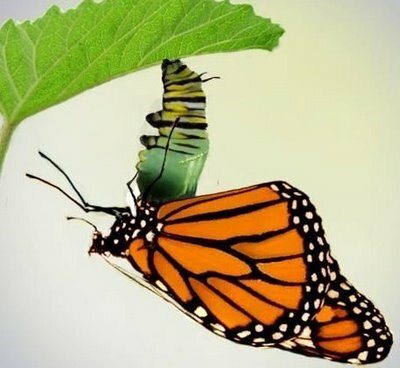 The parallels between the stages of caterpillar-into-butterfly transformation and personal/spiritual growth are uncanny. Here are the 'facts' about this fairy-tale form of life, and how it serves as a superlative example of what we can expect from ourselves and our lives... and how effortless, painless, and peaceful the transformation can be. At first, the imaginals are fought off and destroyed by the intelligence of the caterpillar organism. But the imaginals keep coming back and eventually form clusters of cells to strengthen their domain. The pictures on this page show the beginning of the physical transformation the caterpillar undergoes, and certainly connotes a temporary state of chaos. The stages of growth and emergence in the life of a butterfly are clearly defined, each stage fulfilling a specific purpose necessary to achieve maturity. The 3rd & 4th are those that seem most magical, if not down right impossible. 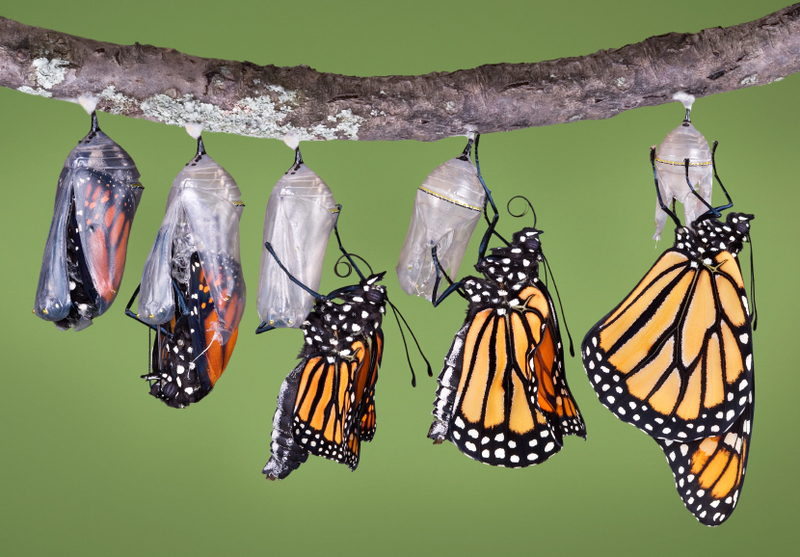 Finally, when the caterpillar has done all of its forming and changing inside the pupa, if you are lucky, you will get to see an adult butterfly emerge. When the butterfly first emerges from the chrysalis, both of the wings are going to be soft and folded against its body. This is because the butterfly had to fit all its new parts inside of the pupa.